Cisplatin is responsible for abnormally low zinc levels in patients undergoing chemotherapy, say scientists in China and the UK. Platinum-based compounds, like cisplatin, are the most widely used anticancer drugs in medicine. Research shows that up to 98 per cent of cisplatin binds to blood plasma proteins, particularly albumin. Until now, little has been known about the specific binding sites for platinum on albumin. 'Since albumin plays a major role in cisplatin metabolism, a better understanding of its interactions with albumin should lead to more effective use of the drug and avoidance or control of side effects,' says Peter Sadler from the University of Warwick, in the UK. Together with Fuyi Wang's team from the Chinese Academy of Sciences in Beijing, Sadler used mass spectroscopy techniques to reveal that cisplatin reacts with recombinant human albumin (rHA) to create a cisplatin-rHA adduct. The platinum occupies zinc binding sites on the albumin, displacing the zinc, which causes hypozincemia (lack of zinc for metabolic processes) and hyperzincuria (increased zinc in urine). 'Sadler's work nicely identifies coordination to two histidine amino acids, forming a cross-link between two peptides in the protein that are also implicated in Zn binding,' says Stephen Lippard, who studies the mechanism of cisplatin at the Massachusetts Institute of Technology, in the US. 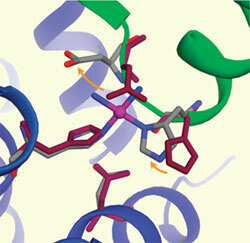 He adds that recognising this binding interaction paves the way for future studies. These studies could help determine whether the adduct facilitates transport to cancer cells or diverts cisplatin from its intended target, either clearing it from the body or leading to the toxic side effects, he explains. Sadler says that platinum has another effect on albumin. One of albumin's roles is to transport fatty acids in the blood, but in the presence of platinum, the longer fatty acid chains are prevented from binding. 'Exciting challenges for future research include exploring the potential role of fatty acids in the allosteric regulation of binding both natural metal ions, such as zinc, and metallodrugs, such as platinum, to albumin,' says Sadler. He adds that the interactive effects of fatty acid and zinc binding to albumin have yet to be fully explored and that such understanding could have a major influence on therapeutic treatments in the future.